95 million votes were cast for the American Idol Grand Finale, showing that American Idol's still got it! The show has been declining in viewership since 2007, but this year with a change in judges and younger than ever contestants, American Idol gained viewers for the first time in three years and looks like it going to be a television fixture for years to come. With JLo and Steven Tyler debuting new songs on the show, it made for great tv this season. 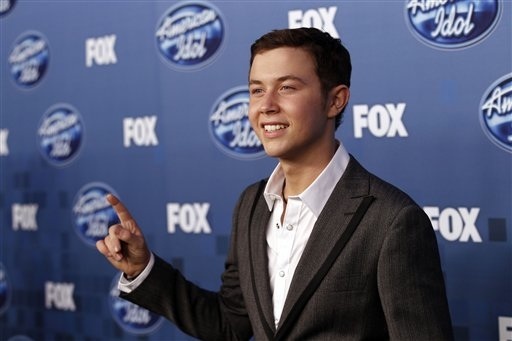 Scotty McCreery, a seventeen year old country crooner from North Carolina, won the night. He debuted a new single called "I Love You This Big" on the Finale show. It was a great show with U2 playing their original score from the Broadway show, "Spiderman: Turn off The Dark" and Spiderman flying through the auditorium. Carrie Underwood performed with Lauren Alaina and Tim McGraw performed with Scotty. Jennifer Lopez, Lady Gaga, Beyonce, and Steven Tyler all performed on the Finale.